Paul Lambert. Feeling a bit sick? Image: Alex Livesey/Getty Images Europe. Bradford City have been out of the footy spotlight for a while now. Sufficient for the likes of us to be startled into match snack abstinence by their unpleasant chicken n’ gravy inspired kit, but not long enough for them to have forgotten how to comprehensively dismantle Premier League sides in cup competitions. The visual spectacle was not improved any by Aston Villa’s key lime pie away colours, but the nausea their travelling fans complained of on the football phone-ins was purely down to performance; aside from a few chances for Benteke in the early stages, they created little that wasn’t easily dealt with by outstanding keeper Matt Duke and were soon punished for the defensive frailties that have become a regular feature of their league performances lately. They were 2-0 behind when Andreas Weimann scored what some have optimistically described as a ‘lifeline‘ – an away goal in the 83rd minute – but after Carl McHugh restored the two goal cushion five minutes later, that optimism, like the Villa squad (and the fans patience) was stretched to breaking point. It’s going to be an appetising second leg, and no mistake. Swansea City were all over Chelsea’s defence last night. Fnar. Image: Clive Rose/Getty Images. After years of controversy and close calls, Chelsea finally figured out how to beat Barcelona last season, narrowly squeezing past the Catalans over two legs in the Champions League semi-final with tight, disciplined performances before lifting the trophy. Unfortunately for them, Swansea City were watching, and last night the Barcelona of South Wales gave the European Champions a lesson in defensive play, and took their chances when they came. And come they did. Despite waves of pressure in the early stages, Rafa Benitez’ team were unable to capitalise and it became clear early on that the first team to make a mistake was going to pay the price. 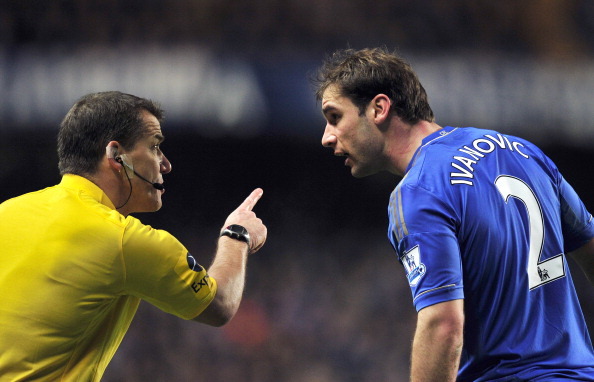 We can only assume that Branislav Ivanovic is still traumatised by the verbal mauling he received from Geoff Shreeves last time he played in a cup semi – the errors that led to both goals were uncharacteristic of the big Serb and and by the final whistle Branny looked as bewildered and broken as he did when Sky’s roving buffoon gleefully broke the news that his yellow card put him out of the CL final. At least he knows it happened this time.